At Cruse Hardwoods, we understand the importance of a well managed forest and the monetary and aesthetic value it will create for the future generations. That is why at Cruse Hardwoods, we employee several professional forester’s who assist us with long term forest management, land management, and wildlife management contracts. So you might ask "How will this management service benefit me and my property". (administered by one our consulting foresters) Timber stand improvement is the science of removing dead, dying, disease and low value species from your forestland. This will increase the amount of trees that your woods produce. It will also improve the overall value of your forest. By thinning out these trees, you allow your more valuable timber to grow at an incredibly more rapid pace. This service is only available through our land management program. Click on TSI to get more information about what TSI can do for your woods. How can this management service benefit me and my property ? 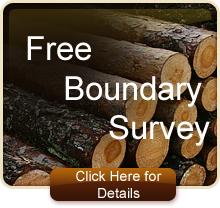 A staked boundary survey is an essential asset when you own forestland. This keeps neighbors and their logging companies off of your property and prevents them for cutting your valuable timber. This survey will also show any vacated easements that might prove valuable when you decide to sell your property. This will also keep neighbors from encroaching on to your property and placing out buildings or deer stands. Conceptual models of the subdivision of my property by our staff civil engineer. This will increase the value of your property because you will know exactly how your land can be subdivided. For example you will know if your best use is a dense or less dense tract volume depending upon where your property is located and what kind of utilities are available. This will also allow you properties around you being used for. This becomes a valuable asset to have if something were to happen and you had to sell some of your land you could just sell part and keep the rest. You could wholesale three parcels quickly as opposed to one large tract which sometimes have a tendency to set on the open market for an extended period of time. Click on subdivide my land for more information. First of all, the last thing any landowner wants is someone trespassing on their property. This will help deter unwanted neighbors and hunters from making their way on to your property and hunting. Second, it deters the liability of having trespassing hunters on your property. If the property is not posted clearly identifying you as the owner, and someone gets hurt or killed, the liability (in the hands of the right attorney) can be devastating to a landowner. This tool will be a good way of eliminating most of that risk. Click on post personalized no trespassing signs to learn more about what we offer to help eliminate the liability of trespassing on your property. Conceptual models of lake site on my property by our staff civil engineer. Who hasn’t always wanted their very own private fishing spot ? 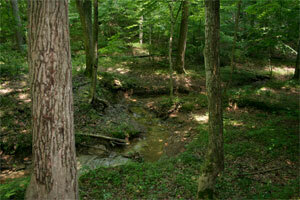 Cruse Hardwoods can determine if you have any potential lake sites. We can show you on a topographical map where it would be placed, how big your lake would be, how much ground you would have to clear, and how much it would cost to construct. Most of time, we can put the lake in for you. This obviously adds value to your land and even if you don’t build the lake, you can always present it when you go to sell your property making it a possible added amenity to your land. Properties that have possible lake sites always have more value on the open market. How can this land management service benefit me and my property ? Satellite maps are always a great to have when you own timberland. This is essential when it comes to harvesting timber. It allows you to create a site plan of where you are going to yard the logs, how you are going to access them, and where your main skid trails will be. They are also nice for picking out those hot spots for deer and turkey, and laying it out on the satellite map to see how you can get closer to the action.